Last time we won! 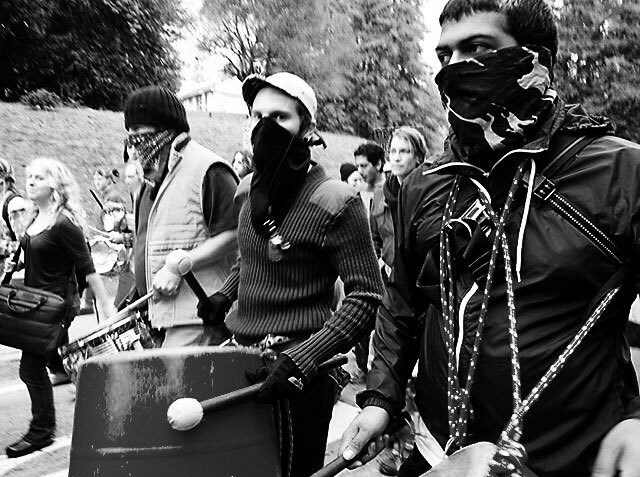 In January, Santa Cruz Police tried to evict the ever-present market drum circle from their spot under the tree, and with the help of Trash Orchestra, the drums drove the cops away. And they stayed away... until now. Last week the drummers were evicted AGAIN by police using the ridiculous 15-minute law (persons cannot be in any city parking lot longer than 15 minutes). Join us to protest that eviction and reclaim that public space! Like Burning Man back in the day, back when we started going in '93. The infinite desert, explosives, and bone-shaking trash percussion. Including a performance at the burning of the desert town of Dismal. it was great to see all of you, and to meet even more wonderful people. I'd like to meet again. What are you doing in around 360 days? The Long Haul has served as a resource center and community space for radical grassroots activists for 15 years. Trash Orchestra will be there to help celebrate. Vegan birthday cake, music, dancing, refreshments, and a general good time. Starts immediately after the Berkeley Critical Mass ride. Website. Come join us as we help celebrate this long-running awesome radical project. "Found With a Match in Her Hand"
Join us as we light ourselves and maybe others on fire at the Crucible's Fire Arts Festival in West Oakland on July 11th. The festival runs Wednesday to Saturday. We're opening on Friday night. We're unsure looking at this photo if this stage is really big or grand enough for us. Catch us at this performance while we are still playing small, intimate gigs. 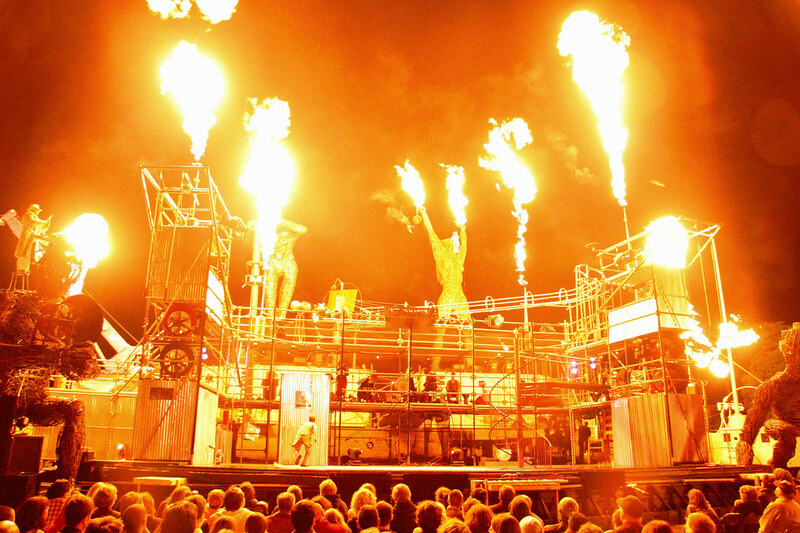 The Crucible’s Fire Arts Festival celebrates creativity through fire and light with a spectacular open-air exhibition of interactive fire art, performance and the largest collection of outdoor fire sculpture on the West Coast. Website. The night ended with Trash Orchestra performance in Modesto's center plaza downtown. Again (1 year later), Santa Cruz folks took the public into the trash orchestrated post apocalyptic vision quest! Smashing on car hubcaps, plastic buckets, symbols & kicking over garbage cans, followed by a Trash Orchestrated Dogpile, set the public's mood on fire! The end of Orchestra ( too late coppers...WE'RE DONE!) resulted in a debate between Modesto police & one T.O. member, with police claiming there were complaints from local merchants (who later denied it adamantly. But police just seemed more interested in trying to prove they were arrogantly right & boasting their authority -- but whats new?! Again, from Modesto police, "We're not impressed. " Trash Orchestra joins the annual pride parade, a celebration of lesbian, gay, bisexual, transgendered, intersex and questioning community. Come support your queer friends, family, and neighbors. The Santa Cruz LGBT Pride Parade 2008 will gather at Pacific Avenue and Cathcart Street at 10 am on Sunday, June 1, and will step off at 11 am. The Festival happens directly after the parade in San Lorenzo Park. Attendance will likely be over 5,000. This year the festival starts at NOON and goes to 6PM on June 1st, 2008. The festival will have a Stage with performers of all types.